Locals and visitors are having remarkable experiences in BC, and across Canada, and are sharing those stories through social media to create powerful word-of-mouth marketing. Many of us in BC tourism spend time curating this content to amplify through our own online channels, often searching for similar content to share with the same potential travelers. This creates duplication of effort. Our team is excited to share that we’ll be participating in the new cross-Canada User Generated Content Partner Network, in partnership with Destination Canada, all the provinces and territories – plus other tourism marketing organizations around BC. This will allow us all to work together to streamline the way we source user- generated content (UGC), reducing duplication and allowing us to collectively find or “surface” the best content for use across our social channels. The network, powered by CrowdRiff, will allow any participating organization to easily feed UGC directly to Destination Canada, Destination BC, and/or any regional and community destination marketing organizations that are also participating. By joining, you’ll help surface the best content from your destination, sector, or organization, so partners like us can amplify it across our global social media channels. You’ll also be able to access special pricing for CrowdRiff that has been negotiated on behalf of all members of the tourism industry. What happens when you join the network? The UGC that you tag or ask permission for in CrowdRiff will be automatically visible to Destination Canada, Destination BC, and any other relevant partner organizations in BC. The content that you upload to CrowdRiff (your owned photos and videos) will not be shared in the network initially. This is an opt-in feature that you may choose to add at a later time. Easily feed UGC directly to Destination Canada, Destination BC, and/or regional and community destination marketing organizations. 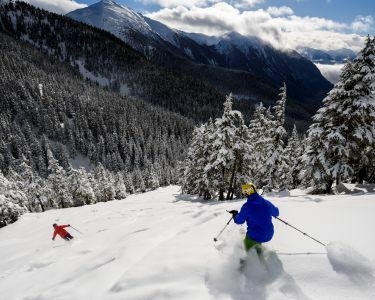 Destination BC will be able to look through the curated photos from Tourism Kamloops to find great winter content. Our team will be able to quickly see what the local experts at Tourism Kamloops think is the best UGC content from their destination this season. This will save time and allow our audience to see the best experiences Kamloops has to offer. If Tourism Victoria’s main attractions join the network, they will have a steady source of quality content they can curate and use to develop galleries on their website using CrowdRiff’s gallery feature. If a small business already uses a UGC rights management tool to source content, the photos they curated will automatically be shared with partner organizations when they join the network. This makes it far more likely they will be amplified by other accounts and seen by more potential travellers. Anyone in the Canadian tourism industry (or a related sector) may join the network. On January 9 at 10am PST Destination BC and CrowdRiff will be hosting a webinar to provide more information on the User Generated Content Partner Network. What is the UGC Partner Network and how can it benefit my organization? What is CrowdRiff and how can it support my organization’s content marketing efforts? How will I be able to easily feed user-generated content directly to Destination Canada, Destination BC and to regional and community destination marketing organizations by joining the network? How can I take advantage of the preferred co-op pricing that Destination Canada has secured for all Canadian tourism partners?